As is the case even today, there is a temptation to complicate religious practice and ritual. The "otherworldly" must appear exotic and mysterious. This was certainly the case in many ancient pagan religions. The scripture of Israel tell a different story. They do repeat again and again that God is entirely different than humankind. The Lord's perspective and ways are beyond our full comprehension. At the same time, the Old Testament teaches that God have given His people a mind and the faculty to discern the Lord's presence and will. The Law, in particular, is a gift that presumes the human capacity to hear and understand. And so Moses instructs the people at the end of his farewell address. He exhorts them to receive this gift and to allow it to shape and guide them. Psalm 69 provides the cry of the one in need - in this case the suffering exile. It calls out to God and expresses confidence in God's loving compassion. If Moses offered the Law as the primary means of grasping God's will for human beings, Paul points with great passion to a new kind of law. More than words, it is the Person of Christ Who offers the perfect, full, and final Revelation of the Father. Here in Colossians, we hear a hymn of praise to the sovereignty of the Son of God - the Son Who is written into the very fabric of creation. Even as Paul acclaims His power and authority, we begin to see that this is a different kind of power. It is the power of self gift - of selfless, reconciling, saving love. Submission to this sovereign is not the loss of self and freedom but the discovery of God's original plan for humankind. Luke's Gospel includes memorable and compelling parables. The beloved parable that Jesus relates in this passage has had an enormous effect on Christian morality and culture. The parable is occasioned by the question of the scholar of the law, "who is my neighbor?" The answer is both clear and complex. On one level, the passage is a morality play. The reader can place himself or herself in the place of the priest and levite or that of the Samaritan - on the one hand a negative model of the failure to respond to one in need, and on the other hand a surprising model of compassion whose concrete actions offer the answer to the scholar's question. Of course the details of the story provide rich fare for further reflection. Samaritans and Jews were bitter enemies in Jesus' day. The priest and levite are "coming down" from Jerusalem, presumably from their service in the temple precincts. Their reasons for passing by the body in the road may have to do with the fear of rendering themselves unclean through the touch of a dead body. Or perhaps they have the common human reticence to "get involved," especially when they themselves might feel vulnerable on the road. The Samaritan provides the starkest of contrasts with their failure. He, more than they, has cause to be afraid as he is traveling alone in hostile territory. The man in the road, presumably a Jew, has no claim upon him. And yet the man stops and provides extraordinarily thorough and generous care. He literally saves the man from death. As we consider the story from the various perspectives of the characters, we must not fail to consider that of the man in the road. If we do so, we begin to discern the most profound meaning of this parable. More than offering models of good and bad moral behavior, it offers a witness to Christ. 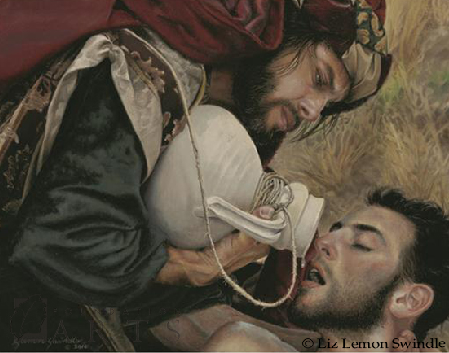 What if we identify with that man on the brink of death and recognize that the Samaritan is a Christ figure? Jesus, after all, comes from a "foreign" land - the Kingdom of God. He owes nothing to a sinful human race which has placed itself on the edge of death by rejecting God. And yet this Jesus, upon Whom we have no claim, lifts us from the road, cares for us, heals us, and saves us from death. And like the Samaritan, He does so at great personal risk. He too will be stripped and left for dead by the side of a path leading from Jerusalem. ​More than model, this parable offers motive. We are reminded of the nature of God's loving, compassionate gift. We are not commanded to be compassionate as one more rule in a lengthy list - we are called to reflect upon the boundless mercy of God and then participate in that same concrete and loving care of others.